As dire as news coming from Research in Motion is these days, Waterloo Region has a large number of technology companies actively hiring. 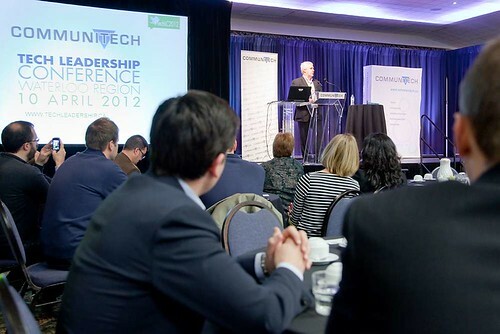 We're really fortunate to have such a variety of local companies here in the Region, and the support of Communitech. Communitech also has a tech jobs website, http://www.waterlootechjobs.com. This past month, I attended the Waterloo TechVibe Recruitment Event, where a number of local companies were recruiting. How did that work out? After the event, I was in different stages of the interview process with six companies, before accepting a position at Desire2Learn. I was really impressed by the variety and quality of companies we have in Waterloo Region. We are far more than just the headquarters of RIM. From radiology workflow solutions at Medicalis, to financial account management at Arius Software, to cross-platform mobile voice solutions such as Fongo, the market is definitely hopping. While it's true that when people think of Waterloo Region technology companies, RIM is often the first company that comes to mind, there are also local Google offices, as well as OpenText. While many companies in the region are in the mobile space, such as Kik and enflick, we also have good representation in the medical and financial services fields. So while the wind may be out of the sails at RIM, the economic outlook for Waterloo Region is still very good, as noted in a recent article in the Waterloo Region Record on a report by the Conference Board of Canada. Will job cuts at RIM hurt? Without a doubt. But the benefit is a more diverse region, where smaller companies are not struggling to find the talent that in the past several years has been going to RIM. Waterloo Region also has great support for technology startups. Communitech has their Hyperdrive program, Waterloo has the Accelerator Centre, and the University of Waterloo has a Velocity incubator. All of these programs offer entrepreneurs with space and access to established mentors, to help build their businesses. While these don't provide large employment numbers now, they do provide opportunities for those in the region. Newer PostWhy is Windows XP stuck with IE 8?